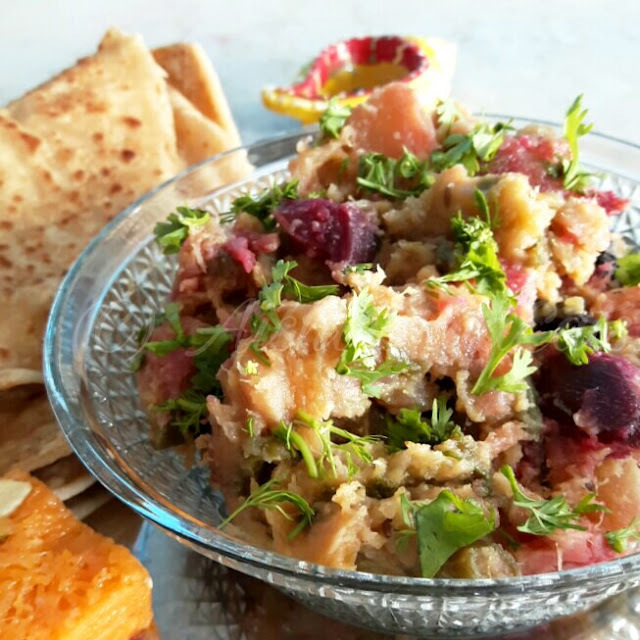 Annakoot: Easy vegetable mishmash for Poojas or lazy days! I do hope your Diwali has gone splendidly, as did mine. I hope it was full of sweets and hugs and laughter, new memories and lights. I hope we shared our joy with those not so fortunate. I hope we were all able to laugh, and enjoy ourselves. Here's wishing you a happy Diwali and a happy year ahead, from my family to yours. Now the day post Diwali, comes something called Govardhan Pooja, a day I have been made aware of only 2 days earlier. One version of this story goes thus: Lord Krishna had given refuge to the residents of Braj from torrential rains for 7 days, by lifting the mountain Govardhan much like an umbrella on his finger. After 7 days, when life resumed, there was not much left in the villagers' kitchens. So a dish is prepared, with whatever is there in the kitchen, and that is offered up to thank Him for His grace. The other version, more practical, suggests that the day after Diwali, either all the vegetable stalls are shut, and/or one is too hungover to go buy veggies. In either case, there aren't fresh vegetables in the larder. So, a mish-mash of vegetables, in sattvik way is prepared which becomes that day's meal. This dish is called "Annakoot". Which is what I'll be describing today, and how I pulled the recipe of this put of my....hat. There is apparently no set recipe to this. All it needs to be is without onion and garlic, and made in ghee. That's what I did, sort of followed the technique of the very famous Bengali Durga Pujo dish "labra" and applied it to what I had on hand. It becomes almost like a bhaji, that you can wipe down with chapati, paratha or even a nice toasted pao. Vegetables you have in your fridge, chopped. I has cauliflower, sweet potato, beans, beets, pumpkins. Wash and chop the vegetables. Cut according to size, for instance, pumpkins and sweet potatoes should not be too big, and cauliflowers should not be too small. Avoid tomatoes. In a large kadhai, add a spoonful of ghee. When it sputters, add in all the vegetables in one go. Stir well. Keep stirring for a while on medium flame for about 5 minutes. Add about 1/4 cup water, and cover to cook. Let this be, stirring infrequently so that it doesn't burn. Let it be till the vegetables have completely softened. Take this out into a bowl. In the same pan, add another spoonful of ghee. When it heats up, add in the bay leaf, heeng and red chilli. Before they burn, but it begins to smell smoky, add in the vegetables. Stir well to cook, so that the ghee reaches all the vegetables. If need be, and if it looks dry, add more ghee. Add salt and sugar to taste. At this point, you can choose to let the pieces be whole, or mash it with a potato masher to make a bhaji. If the latter, then mash it thoroughly with a masher till it reaches the level you want. Cook some more, and take off heat. Sprinkle chopped coriander leaves on top. And it's ready! It feels utterly soothing to the system to have this, after a hard couple of days of partying. And whether or not you do the pooja, like I didn't, it's simply delicious! Let me know how this was!